" ACCU-LOCATOR " is the newly developed intonation adjustment tool for double locking bridges. The one big problem of Floyd Rose type tremolo is intonation adjustment. Because the bridge structure, the intonation adjustment with string tensioned state is impossible, so only way users can adust intonation is to put the saddle by hand roughly and lock it. So it is very difficlut to adjust intonaion precisely and shortly. To solve this problem, there are intonation tools but it has some problems also, like "the torque is very heavy. ", "When rotate the wheel, saddle also rotates." 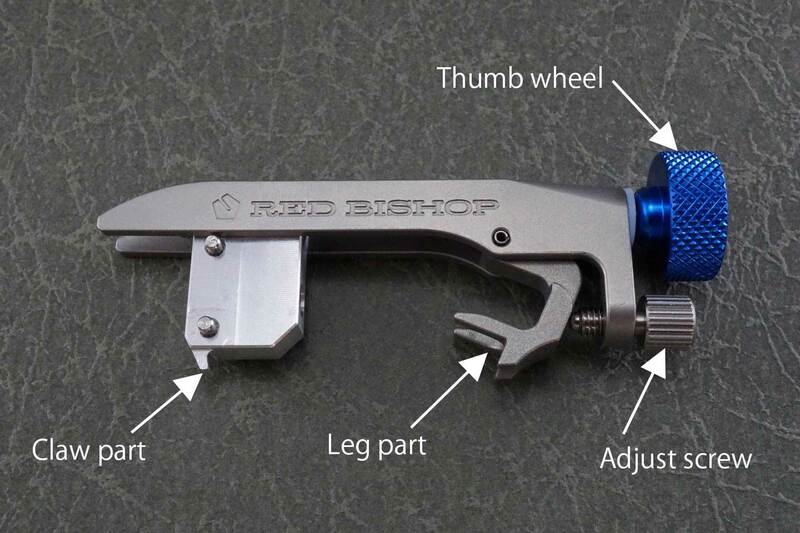 RED BISHOP started to develop more perfect tool, and it is aimed at wide range users, not only Floyd Rose, but also GOTOH 1996T, Ibanez EDGE, Lo-Pro EDGE. And this is it, "ACCU-LOCATOR". ACCU-LOCATOR has a patent pending structure to adjust the leg part angle to various bridge shapes. The Claw part of ACCU-LOCATOR catches and pulls the saddle part directly, so the motion is steady. The large thumb wheel and Teflon washer makes the torque lighter. The precise casting body of stainless steel, machining cut parts, deep blue thumb wheel will give you the pleasure of owning. The patent pending structure makes it possible to mount ACCU-LOCATOR on many type of double locking tremolo bridges. The large diameter Thmub wheel and Teflon washer make the torque lighter. The precise casting body of stainless steel is strong to rust, and with high strength. RED BISHOP logo and machining cut parts give brilliant appearance. If your bridge is regular type (Floyd Rose Original, GOTOH 1996T, Ibanez EDGE and so on), use A screw hole,　and if your bridge is Lo-profile type (Ibanez Lo-Pro EDGE, EDGE-PRO, and so on), use B screw hole. Adjust the fine tuer enough high to Leg part can slide in, and put ACCU-LOCATOR on the saddle that you want to adjust intonation. And it is better to adjust Leg part angle so that ACCU-LOCATOR is pararel to bridge baseplate by rotating Adjust screw in advance. Insert the Claw part into saddle lock pad hole, and rotate Thumb wheel so that there is no wobble. Loosen the saddle lock screw a half rotation. Pick the string and adjust intonation. If the high fret pitch is high, pull the saddle backward, and if the pitch is low, put the saddle forward by rotating thumb screw. To avoid to give too much stress on string, loosen the string tension properly. Sometimes, it occurs some buzz in adjusting operation because the saddle is free state, please continue without having worry. Repeat this operation, and if the intonation is correct, tighten the saddle lock screw. Remove the ACCU-LOCATOR, and it's done. I received my Accu-Locator in my mailbox today. That was certainly very fast. And the tool is quite lovely; I have the Ibanez E-Jack, and this is the logical extension and evolution of that tool. I will be recommending this tool to anyone who, like me, has several different locking bridges which this suits. 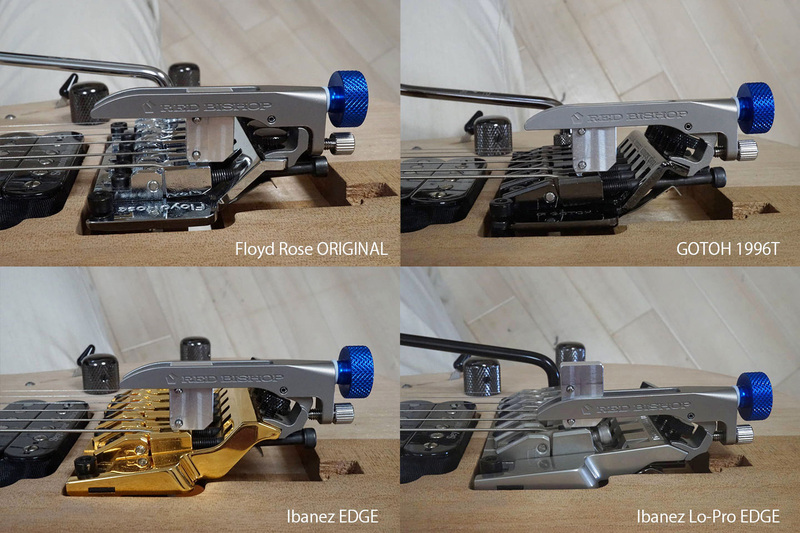 (I have more than one of each: Edge, Lo-Pro, EdgePro, genuine Floyd Rose.) Thanks again! We have received our accu-locator, and love the way it works. Thanks for the great product, it is very well engineered. Vance Custom Guitars has recently received an ACCU-LOCATOR Floyd Rose/Ibanez trem intonation setting tool. The speed, accuracy and ease of use of this innovative tool is simply great. The machining quality and solid stability make using this tool a pleasure and it has already paid for itself in the time saved in just two Floyd setups. The ability to set individual string intonation to strobe accuracy in mere seconds makes this tool a must have for every repair shop. Just brilliant.